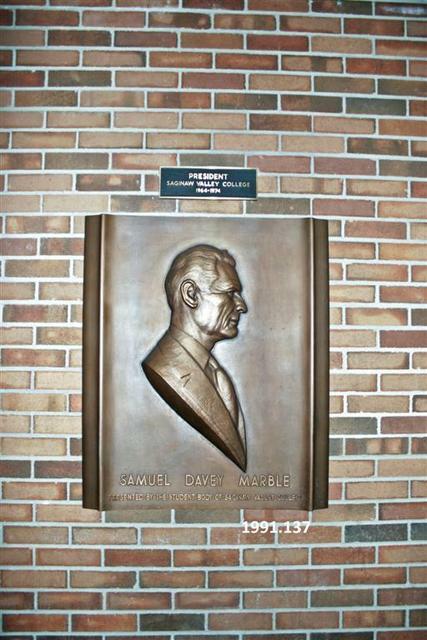 Bronze portrait permanently mounted in the first floor corridor of Wickes Hall. The text on the bronze is "Samuel Davey Presented by the student body of Saginaw valley State College". Fredericks, Marshall M., 1908-1998, “Samuel Davy Marble [Bronze],” Marshall M. Fredericks Sculpture Museum, accessed April 22, 2019, http://omeka.svsu.edu/items/show/5177.